Below is Changnyeong’s response to our petition: Changnyeong, South Korea, Shut down the illegal dog meat farms, slaughterhouses and markets. While Changnyeong County is disputing our legal arguments (based on the legal analysis by KARA), it seems that they are willing to begin the enforcement of existing laws at least in part. We are not sure if they will actively direct their inspections and investigations to identify violations of relevant laws or if they plan to solely rely on those activists bringing claims and evidence of violations directly to them. There are only handful of activists working directly to bring evidence of such violations to the relevant authorities within the country. If local governments like Changnyeong County plan to only rely on the small number of individuals activists to investigate and provide evidence on violations to assist them in enforcing the law, then this is going to be wholly unsustainable and there will be hardly any action taken against the bulk of violators. Nevertheless, their response is more promising when compared to the others that we have received so far. 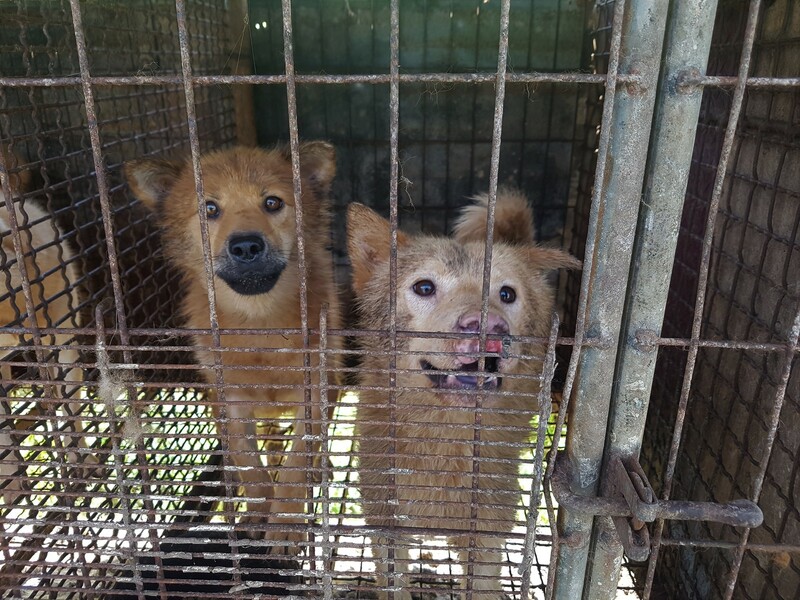 We look forward to witnessing real change to bring this cruel industry to an end and will keep campaigning until the dog meat industry is eradicated in Changnyeong and in every city in South Korea. Q1. Unauthorized processing of food waste fed to dogs in the meat trade is a violation of the Wastes Control Act, Article 15-2, Article 25, Section 3. Suppliers of food waste and transporters of food waste to dog meat farms are violating this regulation. A1. In case of food waste disposal violating the Wastes Control Act, we plan to take action in accordance with relevant laws. Q2. Food waste fed to dogs in the dog meat trade is a violation of the Control of Livestock and Fish Feed Act, Article 14, Section 1 & 2. Unauthorized collection of food waste and the act of feeding it to dogs in the meat trade is in violation of this regulation. A2. We plan to take measures when byproducts and food waste, which are prohibited for use as animal feeds due to concern about the causes of diseases, are used for animal feed according to the Control of Livestock and Fish Feed Act. Q3. 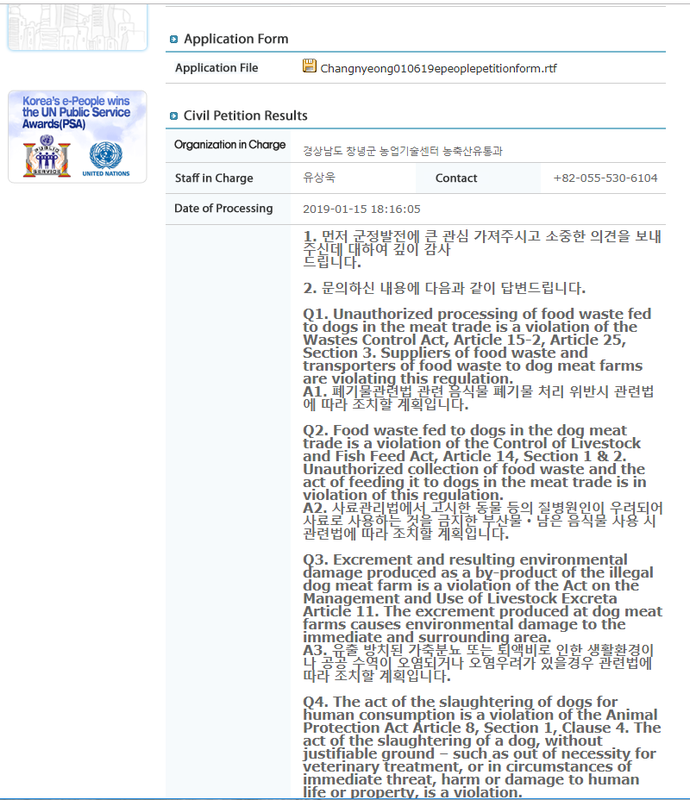 Excrement and resulting environmental damage produced as a by-product of the illegal dog meat farm is a violation of the Act on the Management and Use of Livestock Excreta Article 11. The excrement produced at dog meat farms causes environmental damage to the immediate and surrounding area. A3. If the environment or public water is polluted or there is a risk of pollution due to leaked livestock manure, we plan to take action according to relevant laws. Q4. The act of the slaughtering of dogs for human consumption is a violation of the Animal Protection Act Article 8, Section 1, Clause 4. The act of the slaughtering of a dog, without justifiable ground – such as out of necessity for veterinary treatment, or in circumstances of immediate threat, harm or damage to human life or property, is a violation. A4. The Animal Protection Act Article 8, Section 1, Clause 4 stipulates that animals should not be killed without justifiable reasons. Article 4 (1) of the Enforcement rule of the Animal Protection Act stipulates that “Killing an animal without any justifiable grounds specified in Ordinance of the Ministry of Agriculture, Food and Rural Affairs” under Article 8 (1) 3 of the Act means, “Killing an animal, even when any other means exists, to prevent direct threat to human life or body or damage to property; Using an animal to feed to another animal, without an justifiable reason, such as the behavior of animals, the ecological environment, etc. Therefore, the act of killing animals for food is not explicitly stipulated in Article 8 of the Animal Protection Act and the Enforcement Rules. However, distribution, breeding and slaughter of livestock products are regulated by the Livestock Products Sanitary Control Act, and Article 10 of Animal Protection Act stipulates that in case of killing animals in accordance with the Livestock Products Sanitary Control Act, it is stipulated that suffering should be minimized by applying method such as gas stunning or electrical stunning. However, dogs are not covered by the Livestock Products Sanitary Control Act because it is not classified as livestock in the relevant law. The question about regulating breeding and slaughtering of dogs in Livestock Products Sanitary Control Act has been discussed many times jointly by related government organizations. However, it is concluded that it is necessary to review the dog meat consumption issue in the long run because it requires consensus from our citizens. Q5. 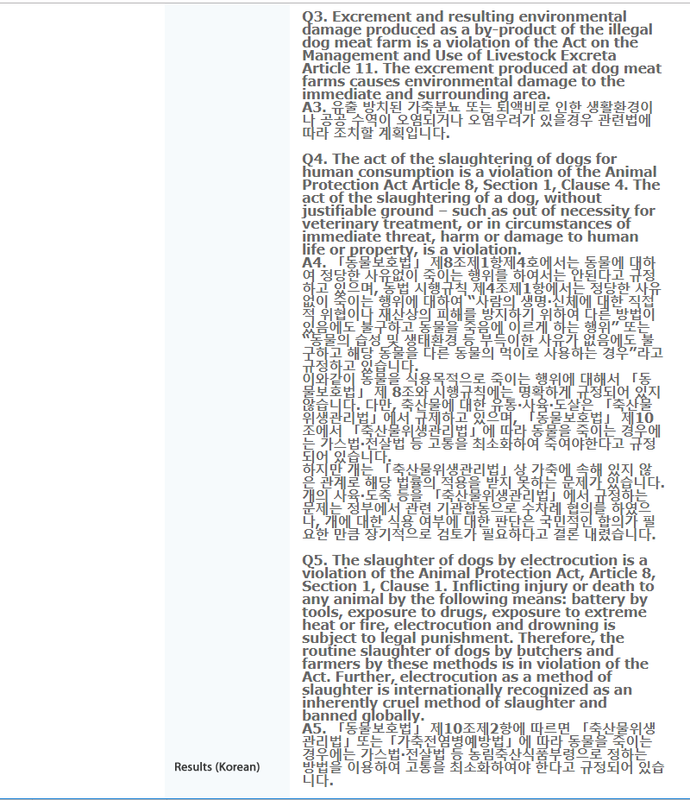 The slaughter of dogs by electrocution is a violation of the Animal Protection Act, Article 8, Section 1, Clause 1. Inflicting injury or death to any animal by the following means: battery by tools, exposure to drugs, exposure to extreme heat or fire, electrocution and drowning is subject to legal punishment. Therefore, the routine slaughter of dogs by butchers and farmers by these methods is in violation of the Act. Further, electrocution as a method of slaughter is internationally recognized as an inherently cruel method of slaughter and banned globally. Q6. The slaughter of dogs from an unauthorized slaughterhouse is a violation of Livestock Products Sanitary Control Act, Article 7 Section 1. The Livestock Products Sanitary Control Act, states that dogs are officially recognized and classified as “animals” that are “prohibited from being slaughtered and distributed as food for human consumption”. Therefore, those vendors operating dog slaughterhouses are operating outside of the parameters of the law and in violation of the law. A6. Under the Livestock Products Sanitary Control Act, dogs are not classified as livestock and are not covered by applicable law. Provisions in which a dog is classified as “an animal that is forbidden from slaughtering as food for human consumption” are not specified in applicable law. 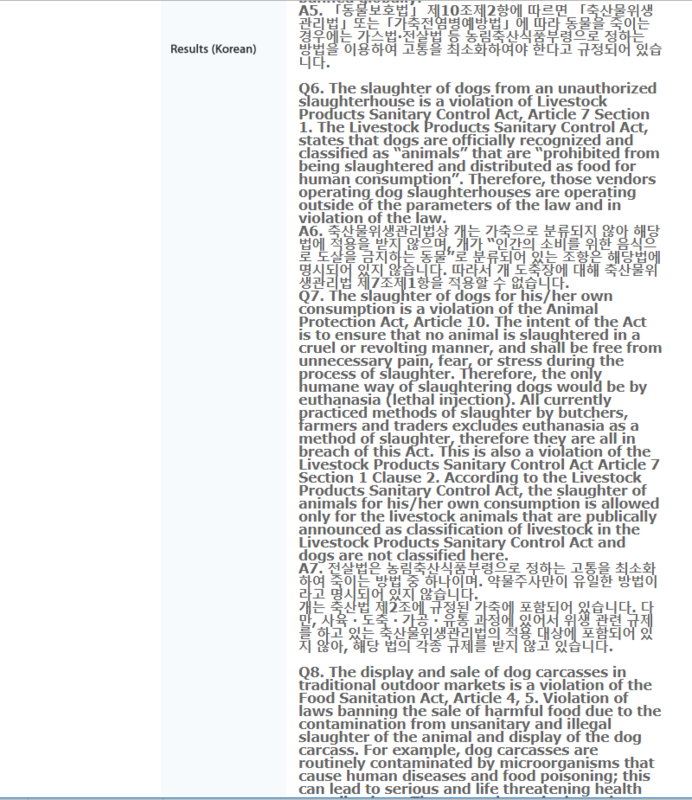 Therefore, Article 7 (1) of the Livestock Hygiene Control Act cannot be applied to dog slaughterhouses. Q7. The slaughter of dogs for his/her own consumption is a violation of the Animal Protection Act, Article 10. The intent of the Act is to ensure that no animal is slaughtered in a cruel or revolting manner, and shall be free from unnecessary pain, fear, or stress during the process of slaughter. Therefore, the only humane way of slaughtering dogs would be by euthanasia (lethal injection). All currently practiced methods of slaughter by butchers, farmers and traders excludes euthanasia as a method of slaughter, therefore they are all in breach of this Act. This is also a violation of the Livestock Products Sanitary Control Act Article 7 Section 1 Clause 2. According to the Livestock Products Sanitary Control Act, the slaughter of animals for his/her own consumption is allowed only for the livestock animals that are publically announced as classification of livestock in the Livestock Products Sanitary Control Act and dogs are not classified here. A7. Electrical stunning is one of the methods slaughtering approved by the Ministry of Agriculture, Forestry and Livestock intended to minimizing suffering and it does not stipulate that drug injection is the only method of slaughter. Dogs are classified as livestock under the Article 2 of the Livestock Act. However, it is not classified as livestock under the Livestock Products Sanitary Control Act, which regulates the process of breeding, slaughtering, processing, and distribution of animals for consumption and therefore, they are not covered by this law. Q8. 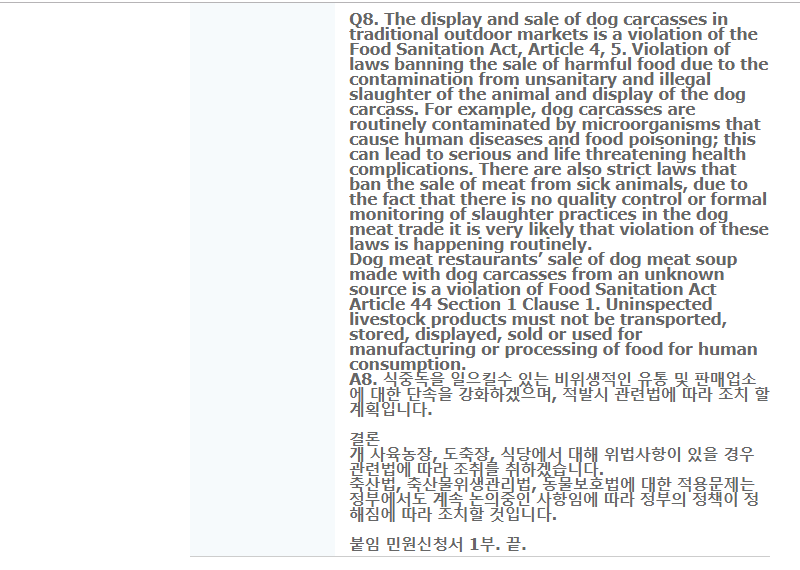 The display and sale of dog carcasses in traditional outdoor markets is a violation of the Food Sanitation Act, Article 4, 5. Violation of laws banning the sale of harmful food due to the contamination from unsanitary and illegal slaughter of the animal and display of the dog carcass. For example, dog carcasses are routinely contaminated by microorganisms that cause human diseases and food poisoning; this can lead to serious and life threatening health complications. There are also strict laws that ban the sale of meat from sick animals, due to the fact that there is no quality control or formal monitoring of slaughter practices in the dog meat trade it is very likely that violation of these laws is happening routinely. A8. We will strengthen the crackdown on unsanitary distribution chains and retail shops that can lead to food poisoning, and we plan to take action according to relevant law when detected. If there is an illegal act in the dog breeding farms, slaughterhouses or restaurants, we will take action according to the relevant law. The Livestock Law, Livestock Products Sanitary Control Act, and Animal Protection Law are still being discussed by the central government therefore we will apply the laws according to their implementation and relevant government policy.